Uh oh, if you're a regular at Tim Hortons you may have noticed the memos that they put up in-store about prices going up soon! Starting August 2, Tim Hortons will reportedly be raising its prices on some hot beverage and breakfast menu items. This is due to "rising operational costs." Tims has yet to announce a list of affected products or how how much the “slight” price increase will be. "This is the second increase of its kind in three years. In November 2014, hot beverages and breakfast sandwiches went up by an average of 10 cents throughout Canada (although breakfast sandwich prices did not increase in Ontario). That same year in April, Tim Hortons also raised the price of some of its baked goods. In 2012, Tim Hortons raised prices on some of its sandwiches by 10 cents to 20 cents, depending on the product and market. 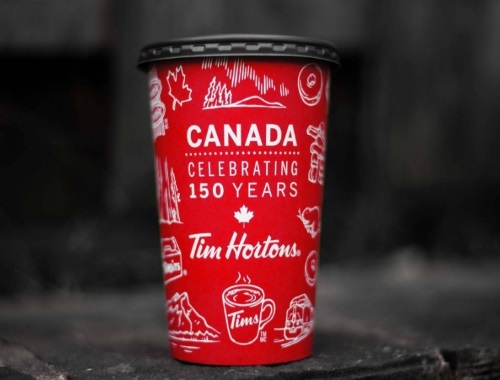 The most dramatic change to Tim Hortons coffee products and pricing came in 2011, when Tim Hortons eliminated the 8-oz. small cup and replaced with its 10-oz. medium, and introduced the 24-oz. extra large size. When the first Tim Hortons store opened in Hamilton, Ont. in 1964, a cup of coffee cost 10 cents" How much is a cup where you live now? Click here to read the Yahoo Finance article here.